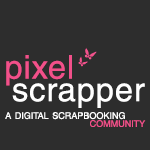 I am very happy to be with you, joining in the 3rd Pixel Scrapper blog train. This time, the theme is Birds and bees, and the color palette is a very soft one. I have a full kit for you, and, as I said in the previous post, I´m trying direct download for it. But. As It´s the first time I do it, I´ll also provide Google Drive links, in case the other link don´t work. If you have any trouble downloading, please leave a comment describing it, so I can fix as soon as possible. To see the other fantastic entries to this blog train, check the list clicking here. Here are my previews and the download links are below. I made a download separated for the solid papers, so, in case you prefer to make your own solids, you save some room in your HD (Their files are big, I don´t know why). Also, if you enjoyed this kit, I need to sugest you to take a look on the mini called Morning Fresh that I made for Scraps and Pieces February blog train. The download link is still active, and the color palette is really close to this one, in a way it´s easy to coordinate both. The theme isn´t too distant either. I have to confess that some times I was thinking on doing something to this kit and them remembered I had something very similar on the older one and gave up. The direct links worked fine for me! Thanks for sharing! Thanks so much~! Lovely papers and elements~!! Your direct links worked fine. Were they at Google Drive also? I tried to figure out how to do a direct download, but things just got worse for me. I'd be interested in points on how you did the direct download if it was from the Google Drive. Thanks...Also loved your humming birds and the worded papers! Thanks for SHARING! Thank You Lorien! Your links worked just fine. Thanks for sharing your part. Thank you Lorien - most generous of you! I love the humming birds! thanks so much for your terrific contribution. Guria, tô naquelas épocas punks, tava acompanhando tudinho do seu blog Um ano e um dia, mas agora faz um tempinho que não consigo ler... logo volto a ativa. Thanks, Lórien! Looks great! Thanks for sharing! Thank you! You did a lovely job on the kit. I love your designs. Especially love those papers, the circles in the diamonds. Thanks so much! Hummingbirds, were my mom's fav. Especially special to me since she passed last year. Thanks for such a great kit. Belíssimo trabalho, obrigada por compartilhar. Thank you so much - very nice! Super Cute!! Thanks so much!!! thank you for this lovely kit, Lorien! the flowers and birds are wonderful for this color scheme!